Neuralstem (NASDAQ:CUR) is a clinical-stage biopharmaceutical company developing novel treatments for nervous system diseases of high unmet medical need. Our lead asset, NSI-189, is a new chemical entity in clinical development for major depressive disorder (MDD) and in preclinical development for Angelman syndrome, irradiation-induced cognitive impairment, neuropathy associated with Type 1 and Type 2 diabetes, and stroke. Our lead stem cell therapy candidate, NSI-566, is a spinal cord-derived neural stem cell line being tested in Amyotrophic Lateral Sclerosis (ALS), chronic spinal cord injury (cSCI), and ischemic stroke. These product candidates are based on the company’s proprietary neural stem cell technology. 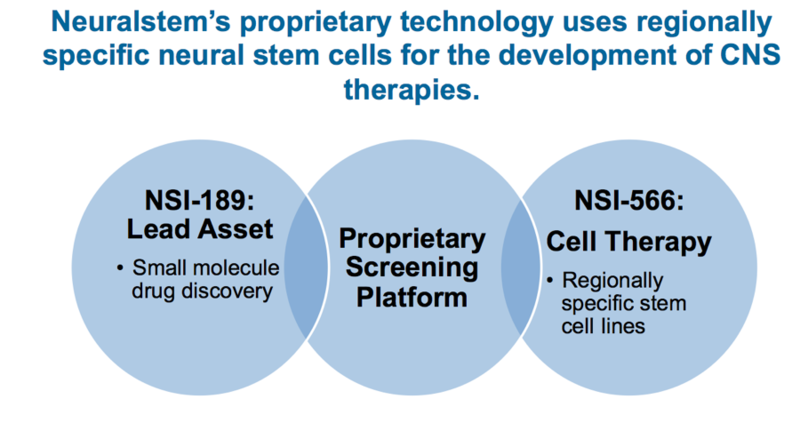 We have three proprietary technologies: The small molecule program, the stem cell therapy program, and a new chemical entity screening platform. The company’s proprietary methodology enables the generation and commercial-scale production of regionally specific neural stem cell lines for use in therapeutic indications or drug screening. This platform enables high content screening of compound libraries for discovery of novel CNS-targeted compounds, and led to the discovery of NSI-189, our lead compound.